HVL is a private community incorporated in the State of Indiana as Hidden Valley Lake Property Owners Association (HVL POA). Our spacious Community Center offers a panoramic view of the dam and marina area. 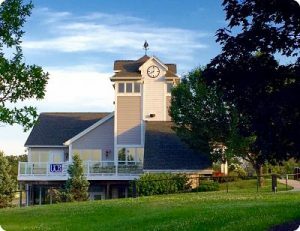 It houses the POA Office, as well as conference rooms, the HVL Fitness Center and a Community Room available for meetings and events. The POA Office is command central for the Community Manager and his staff who manage the day-to-day affairs of the community. With a security force of Dearborn County reserve deputies providing 24/7 service, HVL one of the safest communities in the Greater Cincinnati area. The fully equipped Maintenance Department maintains the 28.5 miles of privately owned roads, lakes, dams and amenities. Although snow removal from our picturesque roads can be challenging, HVL boasts the clearest roads in the county. Please contact any of the personnel below for assistance. We are here to serve the residents of Hidden Valley Lake! Monday – Thursday: 7:30 a.m. — 5:30 p.m. The Hidden Valley Lake POA employs a professional community manager and staff to provide members’ services and facilitate daily operations. Bruce Keller has been the Community Manager at Hidden Valley Lake since 2006. As Community Manager, Bruce is primarily responsible for managing the day-to-day operations at Hidden Valley Lake and for ensuring community compliance with the Bylaws, HVL POA Operations Manual, procedures, and policies established by the Board of Directors. Before coming to Hidden Valley Lake, Bruce was the Special Projects Manager at Ohio Valley Goodwill Industries. Prior to that, Bruce served in the United States Air Force. After 25 years of service with the Air Force, he retired in 2001 with the rank of Chief Master Sergeant. Bruce holds an Associate’s degree in Applied Science and has had extensive training in the areas of facility management, management development, Total Quality, and OSHA requirements. In his spare time, Bruce heads the volunteer board at his church and enjoys life and nature with his wife Angie at their 15-acre farm in Northern Kentucky. Don’t miss out on the latest community information. Subscribe to Keep In Touch to receive the latest news, upcoming events announcements, weather-related information and road closings, environmental and lake news. All delivered right to your inbox! To connect with your neighbors, find lost pets or return found ones, or get the latest community scoop, “LIKE” Hidden Valley Lake Property Owners Association on Facebook. If you are a business owner looking to connect with HVL’s 2000+ households, check out our Business Directory. For $50, you will receive a listing for the calendar year. Consumers can find your business info right at their fingertips and get in touch with just a click. Just follow the instructions for easy online submission and payment. Your competitors will be listed – you should be too! Have a boat to sell, in-home services to offer or having a garage sale? See the Classified Ad submission form (HVL residents only). Choose your category, upload a photo, edit or remove your ad anytime. Read the latest issue of the HVL monthly community newspaper, the Echoes. Submit articles and announcements for publication to Rich Gannon by the deadline: first Friday of each month by 10 a.m. Articles can be submitted by completing the electronic form via this link Submit Article to Echoes. All submissions must be attached as Word documents, photos as jpeg, pdf file or png files. For advertising information, contact Register Publications.